While pre-weaning growth rates of ram and ewe kids may be satisfactory, post-weaning growth rates, in kids that do not receive supplementary feeding after weaning, are often very poor. Kids that are weaned lose weight fast due to “weaning shock” and under normal Karoo conditions can take too long to regain their weaning mass. Low kidding percentages of two-toothed ewes frequently obtained by farmers as well as the high mortality rate that can occur from weaning until first mating is often due to this poor growth.During this period the mortality rate is on average 12, 5 % which is appreciably higher than in other types of small stock. The dramatic improvement in growth rates in these kids when supplemented shows the necessity for an effective supplementary feeding programme. This supplementary feeding should ideally be started before the kids (creep feed ) are removed from the ewes so that they have already adapted to the diet. The weaned kids average ADI was 21,9 g .
The weaned kids ADI 9,6 g per day. The daily gain of the un-weaned group on the lucerne/mealie meal ration was 54 % more than the weaned group. 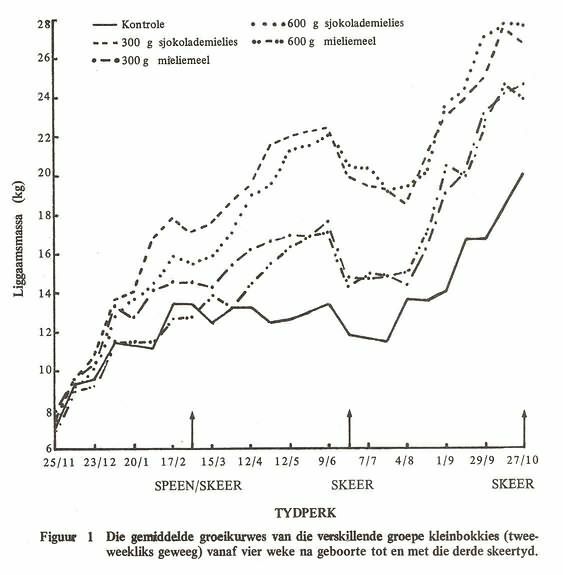 On the poorer ration (lucerne), the growth of the un-weaned group was 85% better than the weaned group. One of the problems when supplementing feed while on the veld is that the kids do not utilise the veld as much. To determine the optimum amount of supplementation was the reason for the number of different rations in the trial. At shearing the SM-group weighed more than the others. There was not much difference between the group that had double the amount chocolate maize. 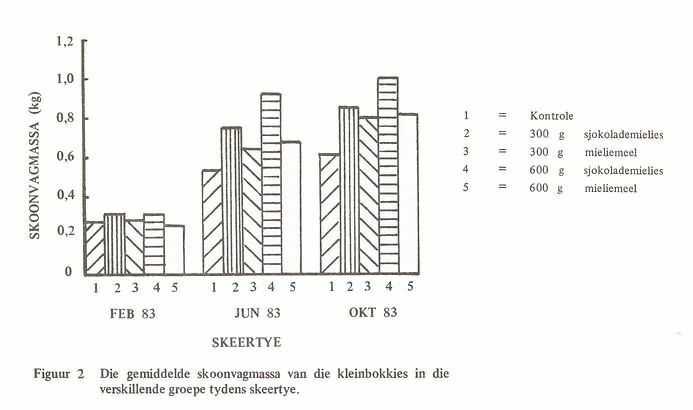 The SM (Chocolate mielies group was about 5.8kg heavier than the mielie meal groups and 8.6 kg heavier than the control. Note the effect of cold on the kids after shearing with all groups’ weights declining. Only after 6 weeks did they start significantly increasing again. At a year old the average body weight of the control was 21 kg, the MM group 24kg and the SM (Chocolate mielies) group was 27kg. Feeding 300g chocolate mielies is the most effective feeding supplement to achieve effective growth. At weaning there is no significant difference in mohair production. At the second shearing the control group produced 0.22kg and 0.39kg less mohair than the 300g and 600g chocolate mielies group. The 300 g SM-group produced 0,11 kg more clean mohair than the milie meel group. The 600g chocolate mielie group produced 0.17kg and 0.28kg more mohair than the 300g SM and 600g MM group. The both chocolate maize group produced more mohair. The 600g produced the most hair.